A tale of sin and redemption set against the background of a 1840s Shaker religious community, The Visionist begins with a flashback written by Sister Charity 50 years after the events. In that short flashback Rachel Urquhart introduces Sister Charity, a young teenager who has lived her whole life in the Shaker community and believes both she and life are simple. The second character introduced is Elder Sister Agnes, who raised Sister Charity from infancy and witnesses the first appearances of visionists, young girls who experience mystical visions. Confused and heartbroken by what she sees as her mother’s desertion, Polly falls into the kind of self-induced trance that she experienced while being abused by her drunken father. That her trance occurs during a Sunday Meeting and is witnessed by the whole Shaker community persuades the religious cult that the City of Hope now has its own visionist. Being exalted as a visionist is not a comfortable role to play in the insular community. Polly’s trances are real and do not occur on demand, thus raising the suspicions of Elder Sister Agnes, a woman whose reputation for her devotion is more veneer that substance. Polly is caught is caught between her growing fear that she will be accused of murdering her father if Elder Sister Agnes’s machinations with Simon Pryor, county fire inspector, result in exposing her sin, and her fear that perhaps her causing the fire was intentional after all. More than the burden of keeping secret her part in causing the fire that killed her father is the even more dangerous secret she carries, one that provides her with a motive for murder and will doom her friendship with Sister Charity. 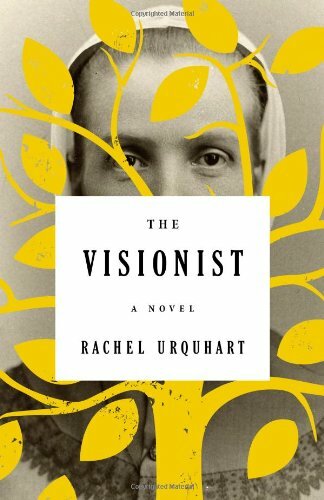 A debut novel that exhibits none of the awkwardness of plot, character, or narrative sometimes found in first novels, The Visionist by Rachel Urquhart is a literary achievement one might expect from a writer with an extensive blacklist of published works, not a novice at the craft of book-length fiction.